A damaged tree roots in Dwarka Sector 12 opposite Shubham Appartments, Plot No 4 (Near Rockland Hospital). DDA is carrying out some work in the area. Quite a number of trees has been damaged. Moreover the contractor is NOT planning to leave the mandatory area around the trees as per the Honorable Delhi High Court and National Green Tribunal Orders. 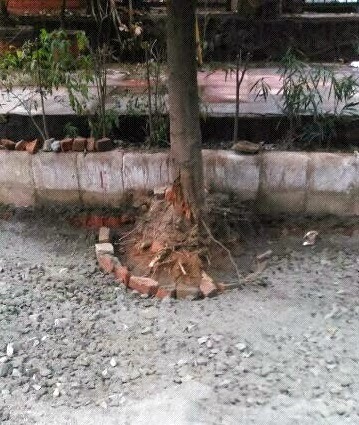 Recently, the PWD (Delhi) was warned for damaging trees and chocking them with concrete. “Be sensible and own your responsibility. You’re a public body. You own a statutory responsibility.” NGT had told in August 2013 in matter of public authority damaging trees. The tribunal had also ruled those found causing the damage again would pay fine from their pockets. Sir, non-compliance will lead to a contempt notice from the Honorable National Green Tribunal. It is highly surprising to note DDA being so negligent. I emphasize that you issue notice to the concerned Executive Engineer and order immediate remedial action in the matter. Looking forward to your immediate action in this crucial matter.